Indonesia tackles deforestation issue Jump to media player Indonesia's government is looking to renew a two-year moratorium on the clearing of forests to improve the environment. Indonesia in the economic spotlight Jump to media player Indonesia is hosting the World Economic Forum this week and hopes the event will help to attract increased foreign investment. Indonesia's rocketing rice prices Jump to media player Indonesians are concerned about a recent spike in rice prices which the government is blaming on mark-ups by market traders. Should firms pay for staff health? Jump to media player Indonesia's government introduced a national healthcare scheme last year but some businesses say it is doubling up on cover they already provide. Indonesia's old remedy faces battle Jump to media player Ancient Indonesian remedy Jamu is facing stiff competition from illegal copies. Can it survive? Indonesia is looking to renew a two-year moratorium on the clearing of forests, which expired on Wednesday. 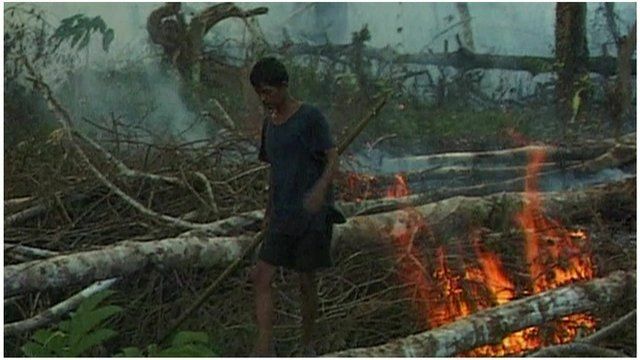 The burning of the forests is a cause of severe haze - air pollution affecting Indonesia and its neighbours. But its economy is heavily dependent on agriculture and mining - both of which require the land to be cleared. The BBC's Leisha Chi reports.